This article contains information about the Inbox in Yammer. It includes helpful tips about how to use the Inbox and a list of frequently asked questions (FAQs). Your Inbox is the single location for viewing, prioritizing, and managing the conversations that are most relevant to you in Yammer. Review all the Yammer activity that's relevant to you in a single location. Prioritize important conversations by marking them as "unread" for later follow-up. Stop following conversations that are no longer relevant to you. Read through your conversations by using a split view for unread and read messages. Stay informed by using the mobile Inbox when you travel. NOTE: The mobile Inbox feature is available for iOS and Android. Your Inbox is located where you used to find private messages. You can access it by clicking Inbox in the left column under My Feed or by clicking the envelope icon in the top navigation pane. In your Inbox, your relevant conversations are sorted into unread and read messages. Unread messages are at the top. You can also post to a group or start a private message by clicking Create Message. In your Inbox, click any conversation to view the full conversation in your Inbox. At the top of the conversation, click Mark As Unread to mark the conversation as unread. This action brings you back to the top-level view of your Inbox. In a conversation, click Stop Following in Inbox in the top header. In a conversation, click Stop Following on the More menu. You decide to follow the conversation. Someone directly replies to a message that you wrote in the conversation. Someone @mentions you in the conversation after you stopped following it. You can follow specific conversations and store them in your Inbox, even if you aren't part of the conversation. To do this, click Follow in Inbox on the More menu in a conversation. Conversations that you follow will be stored in your Inbox so that you can view and manage them. Perform your initial search by using the search bar at the top of your home page. You will arrive at the search results page. Move to the ADVANCED SEARCH section on the right side. In the In: field, type Inbox, and then click Search. The results will now show only conversations in your Inbox. Q: Which messages are delivered to my Inbox? A: Your Inbox contains all the messages that you are following. Generally, this means private messages, announcements, and conversations that you participated in or were @mentioned in. You can also decide to follow any conversation that you want. To do this, click Follow in Inbox on the More menu of a conversation. Q: How can I designate a conversation to be followed in my Inbox? Create a private message or a group conversation. Reply to a group conversation. Select Follow in Inbox on the More menu of a conversation. Q: How can I designate a conversation to be followed in another user’s Inbox? Add that user to a private message. @mention that user in a group conversation. Reply to that user's message. Send an announcement to a group of which the user is a member. Q: If I read a conversation in my Group Feed, and if that conversation also exists in my Inbox, will it be marked as "Read" in my Inbox? Q: How do I differentiate between private messages and group conversations within my Inbox? A: At the top-level view of your Inbox, group conversations show the group to which any particular message is posted. Additionally, an icon appears to the left of your message that indicates the kind of message that it is. 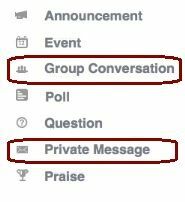 Private messages are marked by an envelope icon, and group conversations are marked by an icon that displays a group of people. Q: How do email notifications work for my Inbox? You receive a single email message only for new unread messages. If there are more unread messages in that same conversation, you don't receive additional email messages. You receive email notifications only for messages directly relevant to you. These messages include private messages, replies, @mentions, and announcements. You don't receive email notifications for Online Now messages when you are Online in Yammer. Q: Why is my Inbox so similar in name and functionality to email? A: We designed the Inbox to work in a way that resembles the email experience because many users are familiar with reading, organizing, and managing their messages in this context. Our intention is that this familiarity will make the feature easy to use. We want to combine the benefits of email with social networking to create a productive, user-friendly experience. Q: Where did all my notifications go? A: With the introduction of the Inbox, you may notice a decrease in notifications. This is because your Inbox will now count new @mentions and replies to your messages rather than cause these events to trigger notifications for you. However, all other kinds of notifications (such as changes to files or Notes, new followers, and likes to your messages) will still remain. Q: How do I create private messages? A: Click Create Message in the upper-right corner of your Inbox to compose a private message. Q: How do I search my Inbox? A: To search your Inbox, you can use the search bar within the Inbox. Or, you can use the main search bar at the top of Yammer to search for all Yammer content. This includes Inbox conversations. You can then filter the results to your Inbox. Q: If I stop following a private message, where does it go? A: The private message will no longer be displayed in your Inbox. However, it will still be available through search. This also applies to Online Now messages because they are treated as private messages. Q: What happens when I stop following a private message? A: If you stop following a private message, it will be removed from your Inbox. However, it will still be available through search. You'll remain on the list of participants but will no longer receive additional messages. The private message can be brought back into your Inbox if someone @mentions you or directly replies to one of your messages. Q: If I stop following a conversation, where does it go? A: The conversion will no longer appear in your Inbox. You can still find the conversation on Yammer in the group to which it was posted. Q: How many announcements will appear in My Feed? A: Up to three unread announcements are displayed at the top of My Feed so that users will never miss important announcements. Q: What happened to the current Announcements box on the right-side navigation bar? A: It was removed and replaced with the new announcements configuration. Now, announcements are located both at the top of My Feed and in the Inbox. Q: What happens to announcements after they are read? A: After an announcement is read for the first time, it no longer appears at the top of My Feed. Instead, it is located in the Read Messages section of your Inbox. Q:What happens if I have more than three announcements? A: Because only three announcements appear at the top of My Feed, you have to click one of the announcements to count it as read. After you click one of the announcements, the next unread announcement appears. Q: How do I use the mobile Inbox? Access: Tap Inbox in the left navigation column. Or, tap the envelope icon in the top header. Manage messages: As soon as you are in your Inbox, select any message to view the full conversation. From here, you can reply and like messages just as you can in the feed. You can also mark conversations as unread to view them later. Send a private messages: In your Inbox, tap the blue icon on the upper right. Select the recipients of the private message, and tap Done when all the recipients are selected. Then, compose your message, and tap Send. Follow or stop following conversations: To follow a conversation so that it will be stored in your Inbox, move to My Feed or to a group feed, and then tap the conversation that you want to open. The conversation opens in the conversation view. Android users will see a flag in the top header. You can tap this flag to follow the conversation and tap again to stop following. iOS users will see a Follow/Stop Following button. This serves the same function. In your mobile Inbox, you can click the X icon to stop following that conversation. Q: How do I disable email notifications for my Inbox? A: In your profile settings, click Edit Account, and then click Notifications. Select the network for which you want to disable notifications, and then click to clear the Email me when I receive a message in my Inbox check box.